In the open ocean the growth of algae (phytoplankton) is typically limited by the concentration of mineral nutrients, often phosphate or iron. The concentrations of these nutrients are typically higher in deeper waters, but the intensity of sunlight decreases with depth and below 100 m algae can't grow. Thus the growth of algae is a ballance between sunlight at the surface and minerals deeper in the water. This report describes bacteria associatied with phytoplankton blooms in the shallow ocean around the tiny islands of Helgoland (marked by the red bollon containing "A" on the map to the right), about 50 Km off the coast of Germany. 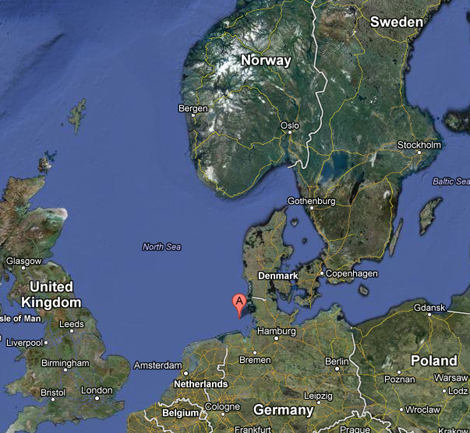 There are two islands, each less than 1 Km in lenght (they were one island until an intense storm in 1720). By the end of summer growth of phytoplankton at the ocean surface has exhaused essential minerials required for growth. Most of the cells have died and the remains have either been consumed by bacteria or sunk to the bottom. Winter storms and winds cause surface and deeper water to mix, bringing minerals to the surface. However, low temperature, low sun intensity, and mixing prevent high phytoplankton concentrations. Increased sunlight and lower wind induced mixing in Spring allows the surface water to warm and form a stable temperature gradient, the thermocline. Now the remaining phytoplankton can grow and multiply to produce a bloom. However, exponential growth of phytoplankton becomes limited later in summer when minerals are exhausted, and the bloom dies to repeat the cycle. Phytoplankton, e.g. diatoms, are green and relatively large (although you may need a low power microscope to see individual cells). Thus they had been recognized and studied for over a century. Marine bacteria are much smaller, and most species do not grow on typical nutrient Petri dishes used to detect the presence of bacteria. It was only with the development of rapid, cheap, methods of DNA sequence analysis in the last decades that it was appreciated that the ocean contains a high concentration of very diverse bacteria. 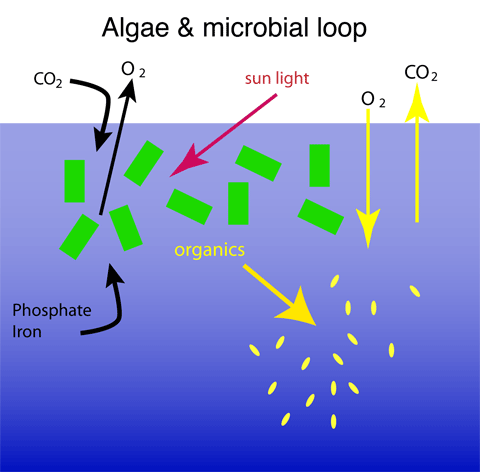 As seen in the diagram on the right, organic material released by phytoplankton is consumed by bacterial to support growth. In the process the bacterial typically consume oxygen, which may come from the atmosphere, or by diffusion through water more directly from the algae. The bacteria produce carbon dioxide, which again can be released into the atmosphere or directly consumed by any growing algae. Thus the algae and bacteria are metabolically linked. 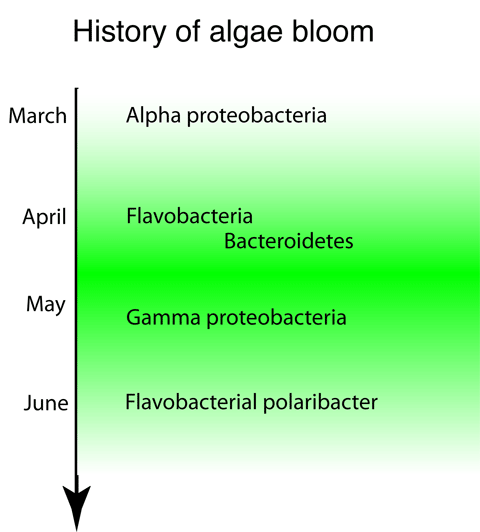 Results: the history of the algae bloom. Water samples were collected every two weeks and the distribution of bacterial species were determined by DNA analysis.As seen in the diagram on the right, the predominant bacterial species changed during the algae bloom . This pattern reflects the changes in the types of organic material available to the bacteria as the bloom progressed through it's cycle of growth. The changes in bacterial species provides an answer to a basic question ecologists have asked about the diversity of bacterial species in the ocean. On land, the great diversity of bacteria can be associated with the great diversity of environments associated with the complex surface of earth. However, the open ocean seems a vast uniform three dimension space. Of course, there is the diversity associated with depth, and the diversity associated with lattitude. However, this study reveals another axis of diversity: the nutrients associated with and released by other plankton with cyclical growth. A later paper: a slightly different cause of algea blooms. As mentioned above, algae blooms start after the ocean water is warmed and vertical mixing decreases during spring. This is likely a fairly complete story in waters of moderate depth, such as the continential shelf that borders large land areas. This would include the waters studied in the above study . However, a second mechanism that can establish a stable vertical water column in the deep ocean, away from continents, is reported by Mahadevan et al. , and summerized by Martin . In this scenario, warmer surface waters are transported Northward by current eddies. These warm waters are thus pushed over colder water to form a stable thermocline, which provides an environment for a phytoplankton bloom. This bloom then starts 20-30 days earlier than would occur by direct warming alone. Don't try this "On The Dock". In the very shallow water around the Dock the vertical forces and stratificaton that are described above are absent. In addition, because the Dock is near many humans, there is an excess of organic and mineral material in the water. No algae is starved for phosphate or iron. Algae concentrations do indeed cycle throughout the year, but mainly due to sun and wind intensities. I described this research because I assume that your interest in the biology on and around the Dock extends out into the ocean. All animals and plants are connected in one way or another.